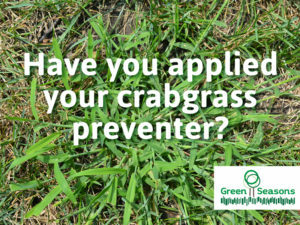 Are you tired of trying to control yellow Nutsedge in your lawn? It’s kind of like if you shave your face or legs and then the next morning realizing you missed a spot. Having yellow Nutsedge is pretty much your lawns equivalent to missing a spot when shaving. You know what I’m talking about! You’ve spent an hour (or 3) mowing and trimming your lawn and then you get up the next day to leave for work and you see the yellow blades of Nutsedge already 2 inches taller than you had left it the evening before! the Papyrus Sedge and Water Chestnut. Yellow Nutsedge is a particular plant that has been used for thousands of year in medicines, food and other uses. 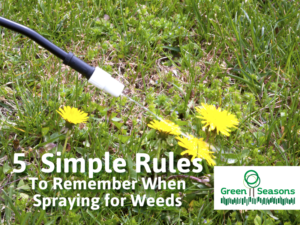 Even though it has many useful purposes, it has been labeled as “the worst weeds in the world”. 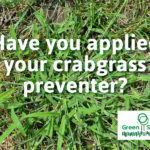 It is damaging too many crops and has been nearly impossible to control in lawns. 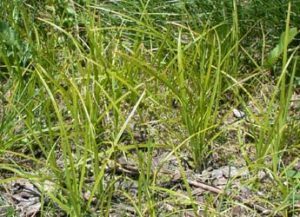 How do I control Yellow Nutsedge? To better control Yellow Nutsedge, I would start by not mowing the lawn to short. 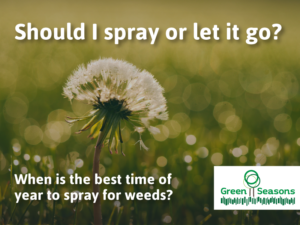 This strengthens that existing grass and allows it to grow thicker and denser, thus helping combat the spread of weeds. I recommend a 3 inch height for Bluegrass lawns and at least 4 inches on Turf Type Fescue Lawns. Next I would try to improve the drainage of the area infested will Yellow Nutsedge. Yellow Nutsedge naturally likes wet conditions. Make sure that water runs off easily and doesn’t create soggy conditions in the soil. Burying downspouts, core aeration and possibly regrading your lawn to allow for better water runoff. Currently there are many herbicides that are labeled to control yellow Nutsedge. My experience will also tell you that currently there are no herbicides that will kill it THE FIRST TIME AND IT NEVER COME BACK. 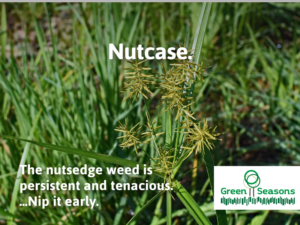 SedgeHammer and Ortho Nutsedge Killer containing Sulfentrazone are going to be your best options for getting control of Yellow Nutsedge by killing the existing plant. 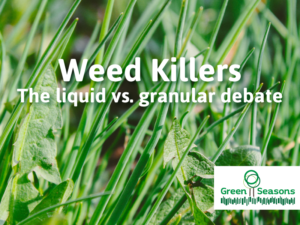 SedgeHammer is a slower acting herbicide where Sulfentrazone is very quick to kill. There are many retail versions of Sulfrentazone. Do not pull the plant out of the ground. 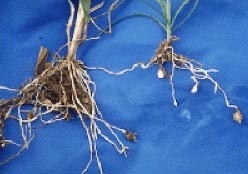 Often times the tuber or “nutlet” will stay in the soil and then grow another plant. Yellow Nutsedge can also spread by sending rhizomes out and growing new plants. Well that’s all folks! I hope this helps you with your journey to a great looking lawn!